Indonesia's carbon bomb goes off, with emissions from peat fires reaching and possibly exceeding their highest levels in 1997-1998. Greenhouse gas emissions from peat fires in Borneo and Sumatra are currently exceeding emissions from the entire U.S. economy, putting Indonesia on track to be one of the world’s largest carbon polluters this year, according to data published a researcher at the University of Amsterdam. By Guido van der Werf’s calculations — posted on the Global Fire Emissions Database (GFED) website — carbon emissions from Indonesia’s fires have just topped the CO2 equivalent of a billion tons — more than the annual emissions of Germany. Since the beginning of September, Indonesia’s fires have been emitting carbon at a rate of 15-20 million tons per day, or more than the 14 million tons emitted on a daily basis by the whole American economy. But El Nino is no excuse — humans are responsible for both lighting fires and creating conditions that enable them to burn. Over the past 30 years, millions of hectares of rainforests and peat swamps have been cleared and degraded, leaving scrub and dried peat that easily burns and is extremely difficult to extinguish once ignited. Much of the environmental degradation has been driven by logging and conversion for industrial oil palm and timber plantations. The haze, a result of forest fires in parts of Indonesia, is set to remain until November, due in part to the dry spell caused by the El Nino effect said to be among the strongest since records were kept in 1950. Indonesia's National Disaster Management Agency (BNPB) said that it will need not only more boots on the ground to fight the fires, but also more money to deal with the crisis. "The number of forest and land fires still has the potential to rise until end-November," said BNPB spokesman Sutopo Purwo Nugroho during a press briefing. Local health and economic impacts of fires have continued after the recent El Niño years of 2002 and 2006. In 2006, Central Kalimantan experienced “unhealthy” or “dangerous” air quality on over 80% of days from September through November (Harrison et al., 2009). The province has the highest rate of asthma anywhere in Indonesia (DNPI, 2010). A total of 1,042 hotspots were recorded in the province in the morning of October 15 Anton of the local meteorology office stated here on Friday. Haze arising from forest and plantation fires in Central Kalimantan Province has drastically reduced visibility to below 50 meters and air quality of Palangka Raya has reached a hazardous level and can impact the health of the public, he pointed out. The Pollutant Standard Index (PSI) has been recording levels close to a staggering 2,000, reaching as high as 2,900. Health Minister Nila Djuwita F. Moeloek had earlier noted that the normal air pollution standard index is 0-50 pm, and above 300 pm is considered hazardous to health. She called on the local inhabitants to stay indoors and wear face masks if they had to engage in outdoor activities. 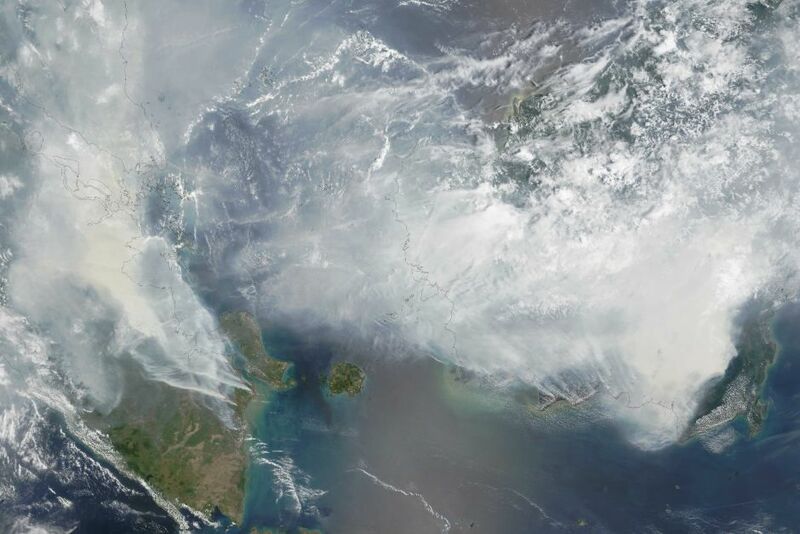 At least 307,360 people in six Indonesian provinces from June 29 to October 5, 2015, had sought medical treatments for respiratory ailments and other diseases caused by smoke or haze from forest fires originating from Indonesias Sumatra and Kalimantan Islands. "The number of patients visiting health facilities has increased by 15-20 percent over the last three weeks. The condition will be very worrisome if the smoke problem is not promptly tackled," Health Minister Moeloek informed the press on Oct. 6. People residing in haze-affected regions have mostly suffered from acute respiratory infections, eye and skin irritations, pneumonia, asthma, and diarrhea. The health ministrys Health Crisis Mitigation Center has recorded some 45,668 cases of haze-related health problems in Riau, 69,734 in Jambi, some 83,276 in South Sumatra, 43,477 in West Kalimantan, 29,104 in South Kalimantan, and 36,101 in Central Kalimantan. Facing growing pressure, Indonesia has accepted International help, including six aircraft from Singapore, Malaysia and Australia. Two aircraft, a L100 Lockheed C130 Water Tanker (Thor) supported by a Turbo Commander 690B lead plane, have now arrived in Sumatra and commenced operations on Wednesday. They are part of the deployment of 32 water-bombing planes and helicopters, assisting the more than 22,000 personnel on the ground. However, International efforts to douse raging Indonesia fires will fail and South-East Asia could face several more weeks of choking smoke until the rainy season starts, Malaysia's environment minister has warned. Indonesia's national disaster management agency has made several forecasts for when the forest fires will be brought under control, many of which have now passed.